Dirt Cheap Science™ - Snap, Crackle, and Jump! Science experiments you CAN do at home using dirt-cheap stuff! It can happen when you least expect it! It doesn't matter who you are or where you live! It strikes without warning in your school, at home and even in the local shopping mall! It is the dreaded sweater head! What's sweater head? That's when you take off a polyester sweater by pulling it over your head and suddenly, your hair goes wild. It starts standing up on end like you've just placed your fingers in a light socket and the more you try to push it down, the more it seems to want to fly away. What causes sweater head? It's simply a case of static electricity at play! Static electricity is produced when different objects rub together causing electrons to be swapped from one thing to another. What are electrons? They are tiny charged particles found in all matter, orbiting the nucleus or central core of atoms. Since all forms of matter are made up of atoms, everything is filled with electrons. Electrons are in constant motion and sometimes they jump from one atom to another. When this happens, the atom becomes "charged". If an atom gains extra electrons, it gets a negative charge. If it loses some electrons, it gets a positive charge. Some types of materials like hair and animal fur love to give up electrons. Other stuff, like rubber and plastic tend to collect extra electrons. When opposite charged things are brought near each other, they tend to attract or stick together. When things with the same charge are brought near each other, they push apart or repel. So how does this explain sweater head? When you pull a polyester sweater over your head, the plastic fibers (Yes! Polyester is a type of plastic!) in the sweater grabs onto extra electrons from the atoms in your hair. This gives the sweater a negative charge and since your hair has lost electrons, it gets a positive charge. Because they have opposite charges, your hair is attracted to the sweater as you lift it away. This isn't the whole story, however. Even after you have removed the sweater, your hair continues to fly up because the individual hairs have the same charge. Since similar charges repel each other, each hair is trying to get as far away from the one next to it! You can do a simple Dirt Cheap experiment showing how this works right in your own home, without even messing up your head (well maybe a little). Blow up the balloon and tie a knot in it. Pour about 1/2 cup of the cereal on a dry table or counter and hold the balloon about 2 inches above it. Now rub the balloon on your head a few times and then hold it above the cereal again. Not only will your hair get an extreme case of sweater head (assuming it's long enough to fly away) but you should notice that the rice cereal will begin to jump up and down. Some might even stick to the balloon for a few seconds before flying off. So what's going on here? Well when you first brought the balloon near the cereal, nothing much happened because the balloon had no charge on it. Rubbing the balloon on your hair not only removed some electrons from your head, but it gave the balloon a serious negative charge. When you brought the balloon near the cereal this time, all the excess electrons on the balloon forced some of the electrons in the cereal to repel to the other side of the cereal grains. This "induced" the side of the cereal facing the balloon to have a positive charge so the cereal was attracted to the balloon. Once the cereal jumped up and touched the balloon however, some of the electrons on the balloon were transferred to the cereal giving it a negative charge. At this point, both the cereal and the balloon had a negative charge so the cereal repelled and jumped back off the balloon. If this all sounds complicated, it is! The truth is, while scientists observed the phenomena of static electricity for thousands of years, they didn't really understand what was happening until the 1900's when they finally worked out the structure of the atom. The bottom line is that experimenting with static electricity is fun and in this case, it gives a whole new meaning to "playing with your food"! 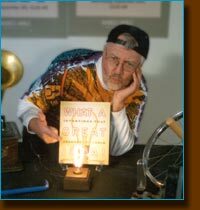 If you enjoyed this experiment and you want to discover more about static electricity and how it relates to magnetism, then you might want to check out my book Simple Attractions. Hope you enjoyed this month's edition of Dirt's Cheap Science. If you want to find out more about The Dirtmeister, my books and programs, check out the rest of my web site and make sure you tell your friends! Site Maintained by Science Plus, Inc.